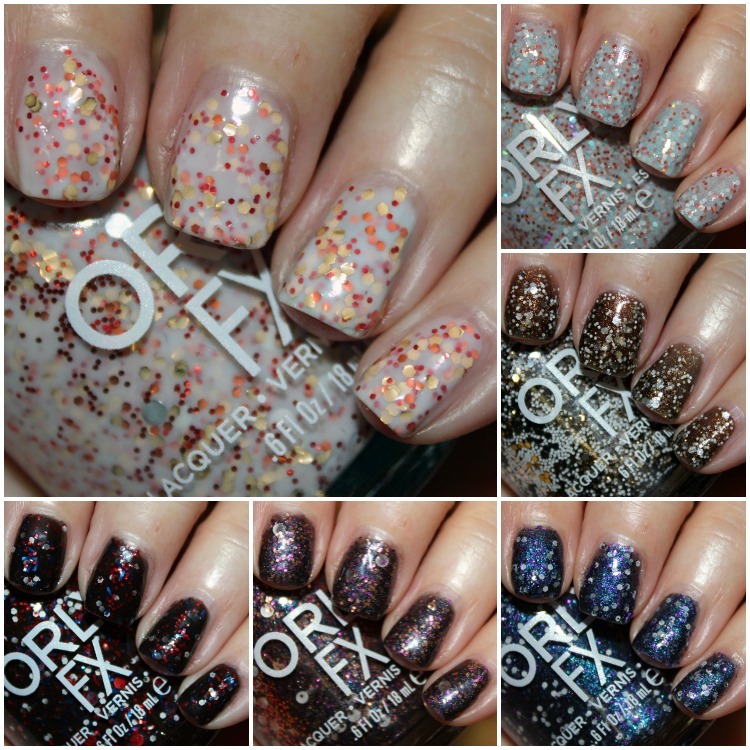 The Orly Galaxy FX for spring 2014 collection is coming out soon and features six new glittery shades. I was a little apprehensive when I saw these in person because they were so glittery I assumed they would be a lumpy mess. But actually most of these applied rather easily and evenly and look really cool. I did two or three coats depending on the shade to completely cover and I waited a good 2-5 minutes in-between each coat to make sure the glitter stayed in place. A few of the ones with larger round glitter pieces gave me some grief. More info below. Starburst has a white base with red, orange and gold glitter. The base is a bit sheer so I did need three coats for this. I love this color combination and how it looks. This is one of my favorites here. I am realizing (after how many years doing this?) that I really prefer glitters with a light base rather than darker ones. Milky Way has a white base and blue, silver holo and bronze glitter. This is another of my favorite ones. I only used two coats here because it was fairly opaque, but I could have used three. Star Trooper has a black base with gold, white and silver glitter. The bottle is so jam packed with white and silver glitter I didn’t even realize how much gold was in here until I swatched it. I love this one also, it kind of looks like a murky olive green. This was two coats. Intergalactic Space has a black base with purple, white, bronze and blue glitter. The white glitter comes in a very large round form. It was a little hard trying to get these larger pieces out and onto the nail. The polish is so thick it doesn’t really shake up or move around in the bottle too much, so that can be a pain. This was three coats and I managed to fish out a round piece for most nails. Gravity Bound has a black base with white, purple and blue glitter. I made a bit of a mess with with swatch but oh well. This was two coats and I managed to get a good amount of all glitters onto the nail with no issue. Black Hole has a black base with red, white and blue glitter. The blue glitter is rectangular which is kind of different. The base was rather sheer with this one so I used three coats. I waited a good five minutes in-between coats because it’s rather thick and tends to get gloopy. There are some large round red glitter pieces in here but none wound up on my nails. This is another one of those where you would have to fish them out if you wanted them on the nails most likely. Nice color combination though. Very patriotic. Overall: Some of these seemed better in terms of formula than others. I think the best ones in terms of formula were Starburst, Milky Way and Star Trooper. Gravity Bound and Black Hole were a bit on the thicker more clumpy side, so more patience is required. I love the color combination in Intergalactic Space, it’s very unusual. I think it would be even better without the large white glitter though. Availability: January 2014 at Sally Beauty, Ulta, etc. Pricing: $10.00 for 0.6 oz. Now that you’ve seen them, which will you be picking up?